Credit: D. Gies (CHARA, GSU) et. al. Explanation: It's clear who is the biggest star in this binary system. Based on recent results, this artist's vision of the double star Phi Persei, 720 light years away, shows a bright, rapidly rotating massive star surrounded by a disk of gas. A small companion star orbits 100 million miles away. 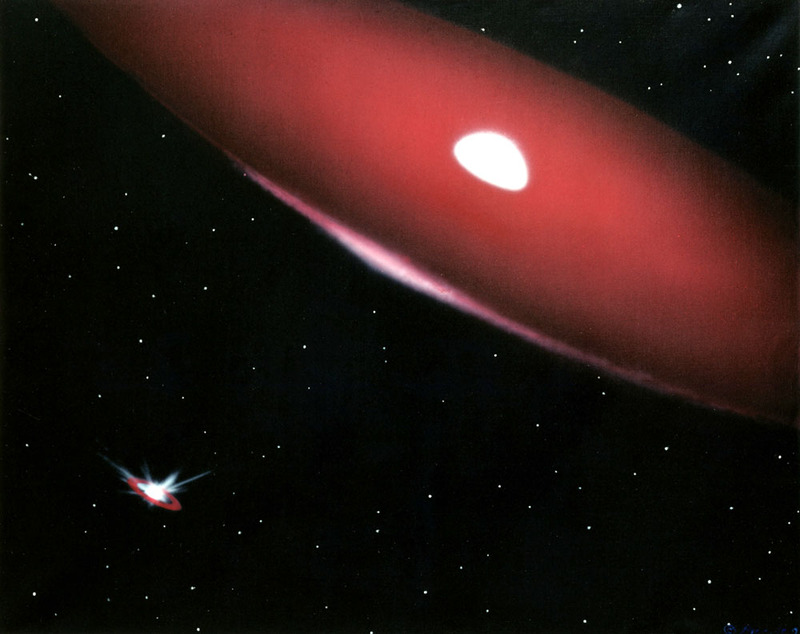 The bigger star is presently about 9 times more massive than the small one ... but it wasn't always this way. Ten million years ago the small companion was actually the most massive star in the system and because of its greater mass evolved into a giant star more quickly. After losing its swollen outer layers to the now massive star, all that remains is a stripped down, intensely hot core of about 1 solar mass. In another ten million years, the roles may reverse as the now massive star swells into its own giant phase "returning" mass to its companion. Will these stars end their lives as white dwarfs or supernovae? Astronomers consider the ultimate fate of such mass-exchanging, interacting binary systems an open question and a challenge for present theories of stellar evolution.